The Congress in Andhra Pradesh says it will support the TDP and YSR Congress no-trust moves. 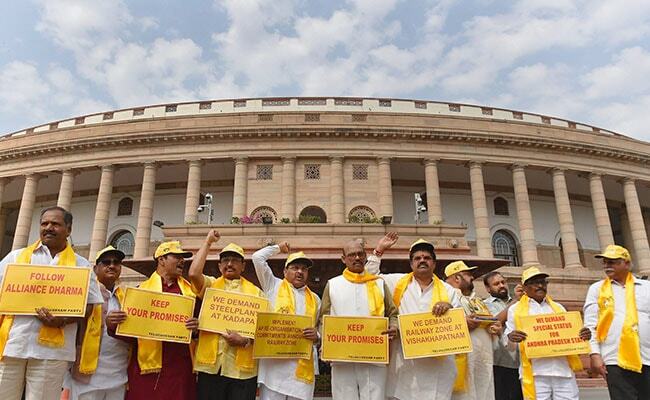 The Telugu Desam Party (TDP) has 16 members in the Lok Sabha. New Delhi: Andhra Pradesh's ruling Telugu Desam Party (TDP), which quit Prime Minister Narendra Modi's coalition today, and its rival YSR Congress have both decided to move no-confidence motions against the government, bringing the state's fiercely competitive politics to the centre. The Congress in Andhra Pradesh says it will support the TDP and YSR Congress no-trust moves. A party needs the support of at least 50 members in the Lok Sabha for its motion of no-confidence to be accepted. The TDP has 16 members in the Lok Sabha. TDP leader Ravindra Babu said his party would have 54 signatures in support of its motion in parliament. "We have decided today we have lost trust from this government. Our trust too is broken. This is why we will file no confidence motion on Monday. We need 54 signatures," Mr Babu said. "We will sincerely carry out this process. We will get 54 signatures and reach parliament on Monday." The YSR Congress has nine lawmakers in Lok Sabha, farther from the required 50 than the TDP. Sources suggest the party is expecting the support of other opposition parties despite the localised issue listed in its motion. The BJP has 274 members, including two nominated members, in the Lok Sabha. It has the support of 56 members from alliance partners.